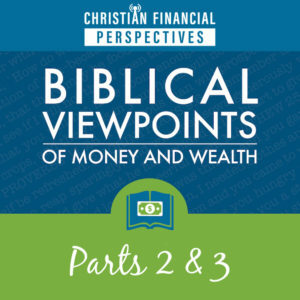 In Parts 2 and 3 of the Biblical Viewpoints of Money and Wealth series, Bob and Mary Jo explore the “Roles and Responsibilities of Owners and Managers” and “The Biblical Worldview of Working and Retirement”. Here at Christian Financial Perspectives, we believe that all financial decisions are spiritual decisions because everything belongs to God, and we are managers of His money. As far as retirement goes, it is one of the best times to use one’s resources to help others and make a positive difference in our world. It can be the best time of a person’s life when one’s wealth is used to serve others. On the flip side, if retirement becomes all about the individual, it can often become meaningless and depressing over time.